My fiancé can sit for hours reading the news. First he cycles through his favourite Spanish papers, and then he ventures into the English ones. His interest in “the news” verges almost on obsession, and he doesn’t understand my aversion to most news sources. If I do read a paper, I will turn immediately to the entertainment and fashion section and pretend that the rest of it doesn’t exist, maybe taking a gander through the comics if there are any. It’s not that I am excessively shallow. I hope. It’s that when I do read the news, my eyes will hit on the horrors of the world, and it’s too much for me to deal with. A couple days ago, as I wasted some time reading blogs, I ended up clicking to a news story out of Texas. A five-year-old boy had been rescued from his father and stepmother’s house. His own parents had kept him locked in a closet, beat him, and refused him food. His older stepbrother had discovered the state of the little boy, gotten into a fist fight with the dad, and the police were called to break them up. In the process, the little boy was discovered. The thing that got me was a picture of the boy, taken from behind, as he sat on a hospital gurney being tended to by nurses. His absurdly thin shoulders were hunched over, and his shoulder blades and spine poked through his skin. He was such a picture of defeat, of unfathomable suffering. He looked as if he was bearing the weight of the world. His hair was a light shade of blonde—the same colour as my little brother’s. I was already struck by the horror of the story but that hair pushed me over the edge. As I sat on the couch staring into space, all I could do was moan over and over Let him be loved. Let him be loved. I wanted more than anything to be able to do something. Anything. Later that day, I was in Adoration, and the picture of the little boy wouldn’t leave my mind. The pulsing pain of a world in which a child can be born into such terror, a world where there are people so devoid of humanity that they can act with such horrific cruelty, seemed to squeeze at my heart until I could barely breathe. And I wept. I couldn’t stop crying. What do I do? How can I help? I want to love him. I want to make sure this can never happen again. I want to rescue all of the children in situations like this. I want the evil to stop. I want the pain to stop. My spinning thoughts were interrupted. This isn’t about you. This isn’t about what you want to do. This is about what I want you to do. What do I want you to do? I sat up, ashamed. Yes—my grief was genuine. Yes—my desire to jump on a plane and search Texas for the little boy so that I could hug and kiss him was real. But my tears were a release for me—they lessened the pressure in my chest and the pain in my heart. My dreams of showing up to rescue the boy were unrealistic and impractical—something that would make me feel better. I wasn’t actually helping anything. I was distracting myself from the reality of what I could do, half a world away. And I was hit over the head with another question. Do you believe in prayer? Do you believe that it is real? Do you believe that I am here, listening? I gave a hesitant yes, but suddenly I did know what I was meant to do. It was simple. It was so simple. I wiped my tears away, looked up at the monstrance, and prayed. I prayed that the little boy would get well. I prayed that his nurses would be kind to him, and sit with him if they had a moment. I prayed that a loving family would welcome him, that his frailness and brokenness might be gathered into arms gentle enough to not break him and strong enough to prove his worth and lovableness to him. I prayed that he would break the cycle of violence and abuse, and be given the grace to forgive, and live a happy life. I prayed that he would live his life courageously, and with love. 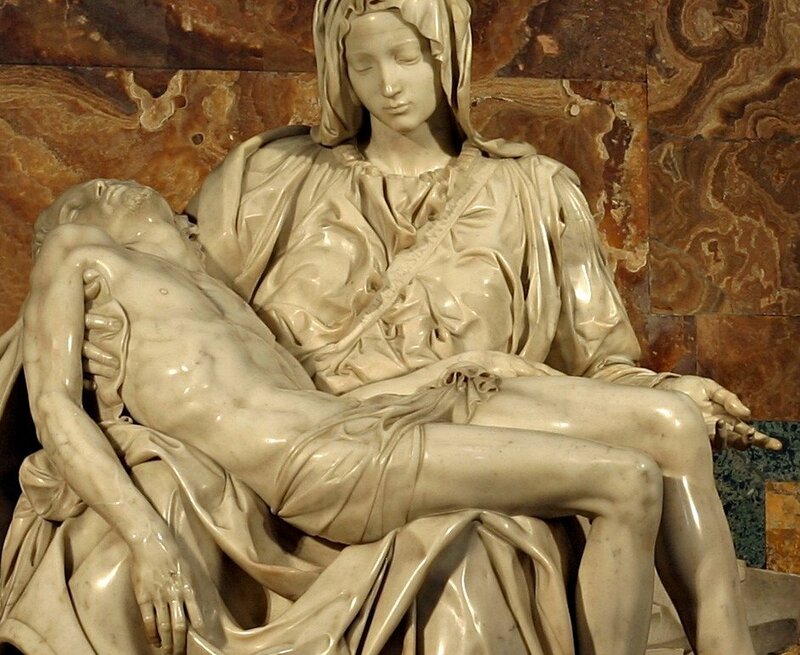 The image of the Pieta came to my mind, and I saw him lying there, next to Christ, being held by Mary. And I prayed that she would hold him in her arms, and that he would feel the reality and immensity of her love for him. And I knew that, just as his older brother who had defended him had done his job, just as the police officers who had responded to the scene had done theirs, just as the nurses who were caring for him and healing his body were doing their work, I was doing mine. That day in Adoration, I was reminded of something monumentally important: in every situation we have a job, a specific task unique to our situation and calling. It is our task to fulfill that job to the best of our abilities, and to trust that in doing so we are contributing to God’s grand plan. I believe that, half a world away, as a news-averse girl living a pampered and sheltered existence, I saw that tiny little boy so that I could pray for him. He dropped into my lap so that I could be a piece in the puzzle of his life. He needs prayers, and that is what I will do. He will never know me. He will never know that, if I could, I would hold him close and tell him that I love him. But that doesn’t matter. What matters is that I do what I can for him, and love him in the only way I am able. Photo credit: By Stanislav Traykov, Niabot (cut out)Stanislav Traykov, Niabot (cut out) [GFDL (http://www.gnu.org/copyleft/fdl.html), CC-BY-SA-3.0 (http://creativecommons.org/licenses/by-sa/3.0/) or CC-BY-2.5 (http://creativecommons.org/licenses/by/2.5)], via Wikimedia Commons.